Energy Bat labs is a R&D workshop and experimental lab conducting research in the alternative energy field. The lab itself is set up to take an idea from scratch to a final workable product. Some ideas will work out and some ideas will not work out. The Projects on this website have been ongoing experimental work for years. Mr. Geoffrey S. Miller has been experimenting on energy related issues and electricity for the past 45 years since he was 10 years old and made his first lab. So he has decided to show some of his work from energybat labs. Some of the projects are his own and some of them are other fellow experimenters in alternative energy field. 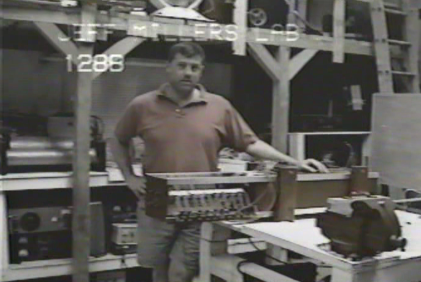 Mr. Miller has tested some of the other experimenters work for commercial feasibility as well as his own experiments. Mr. Miller has spent the last 25 years in private development of a wide variety of products for experimental use. He has operated his ownmachine shop & Energybat labs since graduation from American Institute of Drafting & Design. The shop has over 100 machines/tools at Mr. Miller’s disposal to create anything out of metal/wood or plastic. There are eight computers to design anything using 3-D CAD programs. There are two 3-D printers for prototype molded plastic parts. The lab also has over 75 electrical instruments to do any type of science work. The shop also has the classic drafting table for hands on drawing and a blueprint machine. The shop has a Reference library of over 10,000 books & papers. The goal of some of these projects is to bring out a commercially viable “new prime mover” that will be able to run a 10,000 Watt home generator to run a household’s electrical requirements independent of the establishments energy grid. Below you will find pictures of the projects, short write up, and video of the projects work if applicable. Mr. Miller will be updating this website continually as each project progresses. If you find this information useful please feel free to financially donate so that we can keep this website up and keep R&D work at energybat labs going forward on these projects. Mr. Miller will shortly be releasing residential and commercial alternative energy products for sale as well as experimental devices. To all fellow experimenters Mr. Miller has acquired a huge amount of electrical inventory over the years from power supplies to wire and magnets etc… if you need something and can’t find it on the Web. Send me an e-mail and I may have it at energybat labs, and for agreed-upon price I will ship it out to you. If you want an experimental prototype built, I can do that to. Or on our computers we can design anything you want using solid Works CAD program and send you the CAD files. People wanting to know more about individual projects can contact Mr. Miller through this website. Thank you and enjoy the website and have fun experimenting.